The latest version of AOMEI Backupper is 4.1, why AOMEI Backupper Network is 1.0 which is a centralized Windows backup software and a new product developed by AOMEI Technology company. Before talking about AOMEI Backupper Network, you should know that traditional AOMEI Backupper has free AOMEI Backupper Standard, paid AOMEI Backupper Professional, AOMEI Backupper Server, AOMEI Backupper Technician and AOMEI Backupper Technician Plus. But this AOMEI Backupper Network is a new one and different from above-mentioned products. AOMEI Backupper Network’s interface and features are entirely new. AOMEI has released AOMEI PXE Boot and AOMEI Image Deploy before, and AOMEI Backupper Network like them is a 100% new product, maybe its name is AOMEI Network Backupper will be easy to understand. To deploy AOMEI Backupper Network 1.0, you should use it with the free backup software AOMEI Backupper Standard Edition together. On the homepage, you see, right to Download network Free is Download Client Free button, which lets you download the free AOMEI Backupper Standard. Notice that the bigger size version of Backupper Standard is fully supported to install it on Windows 10, 8.1, 8, 7, Vista, XP and create WinPE &Linux bootable rescue media, while the smaller version only support to install on Windows 10, 8.1, 8, 7 and create WinPE bootable rescue media only. Please choose to download AOMEI Backupper Standard version according to your requirements. Why need AOMEI Backupper? If you are an admin who wants to backup and manage all computers in the room, we highly recommend you to download AOMEI Backupper Network from AOMEI official website and try. With it, you could save lots of time and cut down costs. It is easy to learn how to handle and deploy. At first, decide a computer as the server in the network, install AOMEI Backupper Network on it, other computer machines in the LAN are clients, you should install AOMEI Backupper Standard on them. There are two ways to install AOMEI Backupper Standard. The first one is manual client installation, which means install it on the computers one by one manually if you select this one and click Next, will open the folder contains AOMEI Backupper Standard Installation package. 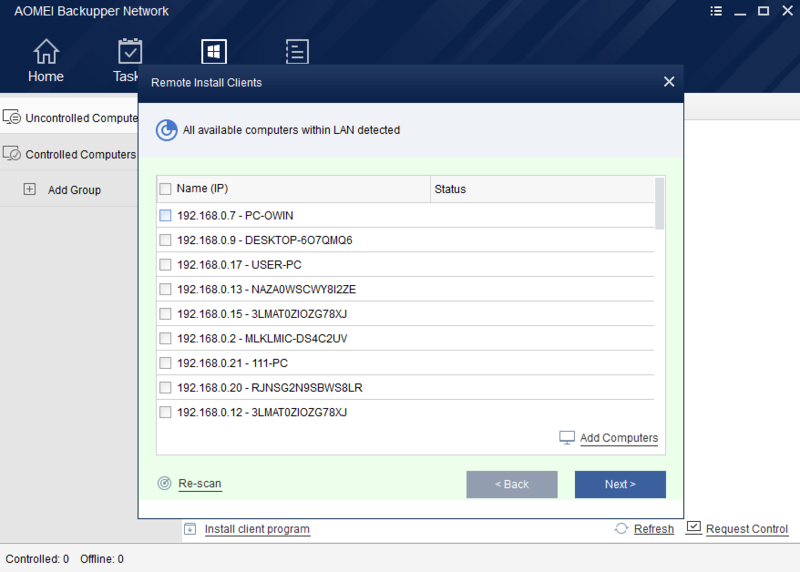 If you select the second one – remote client installation and click Next, will pop-up a new window, AOMEI Backupper Network will detect all available computers within LAN. This is AOMEI Backupper Network’s automatic scan function, scan, and list. To control them, just input login information (domain account supported) or send a request. At last, install, update or even uninstall AOMEI Backupper client programs later on them. If computers are not listed, you could also add them manually by entering IP address or NetBIOS name. This is another function of AOMEI Backupper – Add Offline Computers: Add those offline controlled computers into the task and they will be automatically executed the backup task once they’re online. For controlled computers, you are able to make a category or say group to manage them easily. 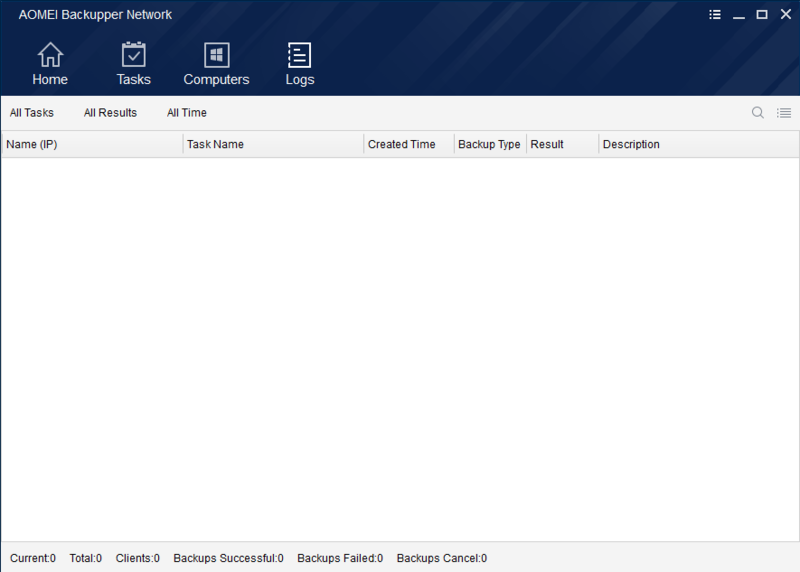 About missions, AOMEI Network now supports creating system backup, disk backup, and partition backup. No clone and sync yet. All backup as traditional AOMEI backup software, only a few steps to finish, has additional setting options and schedule settings. The former has added comments, encrypt backup images with passwords, choose backup compression level, split backup images, VSS, intelligent sector and others. The latter supports full, incremental and differential backups. Automatic run daily, weekly, monthly or based on an event, for example, system startup, system shutdown, etc. Obviously, AOMEI Backupper Network inherits backup features from original AOMEI Backupper. Except these, this Backupper Network has its own key features. Such as Flexible Backup Rules: when going to backup partition and disk, it allows you to specify which will be backed up by creating a template based on one of the client computers or choosing specified disks, disk number, partition number, drive letters or partition labels to match. Logs Report: please see the following screenshot, there is a Logs window, you can switch to there via clicking the top forth button. Also, you can generate log reports with one click. By the way, the log reports are in HTML format. Cross-segment Backup: Backup client computers in IP segments that differs from the central computer. Installation Package with Authorization Code: Create an installation package with the authorization code. Once the client computers have installed the package, the central computer will be automatically authorized with control permission. AOMEI Backupper Network 1.0 is a free tool, everyone can enjoy it without charge. 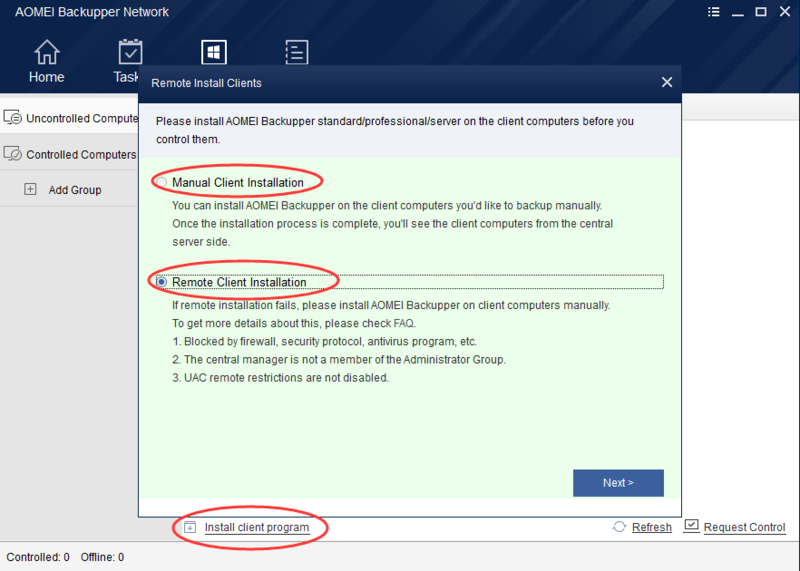 It can make and manage backup missions on desktop PCs, laptops and virtual machines(if they are VMware, VirtualBox, Hyper-V, etc, you should install AOMEI Backupper Standard in the virtual machines.) within the same LAN from a single central management computer. AOMEI Backuper Network1.0 fully supports Windows 10, 8.1, 8, 7, Vista, XP, Windows Server 2003, 2008 (R2), 2012 (R2), 2016, Windows SBS 2003, 2008, 2011 and Windows Home Server 2011 (32/64-bit). Now you see, AOMEI Backupper Network is strong and easy to use. We think it is very useful for admins to protect and manage machines in the lab. The current 1.0 version has many places to be improved and expanded. such as multiple languages support, sync and clone functions, etc. If you have any suggestions, please leave a comment on the following box or discuss in AOMEI forum.